Flogging Molly is a seven-piece Irish American celtic punk band that formed in Los Angeles, in 1997 and is currently signed to SideOneDummy Records. The band consists of Dave King (vocals, guitar, banjo, bodhr?n), Bridget Regan-King (fiddle, uillean pipes, vocals), Dennis Casey (guitar, vocals), Matt Hensley (accordion, concertina), Nathen Maxwell (bass, vocals), Bob Schmidt (mandolin, banjo) and George Schwindt (drums, percussion). 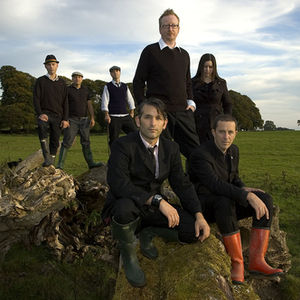 Flogging Molly has released four major studio albums, Swagger, Drunken Lullabies, Within a Mile of Home, and Float, as well as an independent live album entitled Alive Behind the Green Door. Also, they released a CD/DVD combo entitled Whiskey On A Sunday, which included a CD with acoustic tracks of many of the band's songs and a brand new studio track, "Laura". They have toured with the Warped Tour and Larry Kirwan's American Fl?adh Festival. They also contributed to the Rock Against Bush project. Also, as of late they have done extensive touring with the self proclaimed gypsy punk band, Gogol Bordello, which is also signed under SideOneDummy Records. The driving forces behind the music tend to be Dave King's gravelly voice and Bridget's manic fiddling. Prior to forming Flogging Molly, Dave King was the vocalist for Fastway, a late 80s-early 90s heavy metal band, featuring guitarist Eddie Clarke of Mot&ouml;rhead. The band released a DVD and a full-length album entitled "Whiskey on a Sunday" on July 25th 2006. The DVD "Whiskey on a Sunday" contains a two hour documentary that gives viewers insight into how the band members found each other and also talks about the members' attitude towards life, events that have shaped their lives and their motivation for making music. The band released "Float" on March 4, 2008. It includes the band's first two chart hits: "Requiem for a Dying Song" (#35 Billboard Modern Rock) and "Float" (#40 on the same chart). During the tour for the album, vocalist Dave King married the band's fiddle player Bridget Regan in Tokyo, Japan. The Speed of Darkness Songfacts says the band's fifth album, Speed of Darkness was released on May 31, 2011 by the band's own record label, Borstal Beat Records.The set was recorded at Echo Mountain, an old church building turned recording studio in Asheville, North Carolina. It was produced by Ryan Hewitt, who has also worked with the Red Hot Chili Peppers and The Avett Brothers.